Mayor R. Rex Parris speaks at an event in Lancaster Thursday morning to celebrate the 1,000th solar powered home built by KB Home and powered by SunPower. 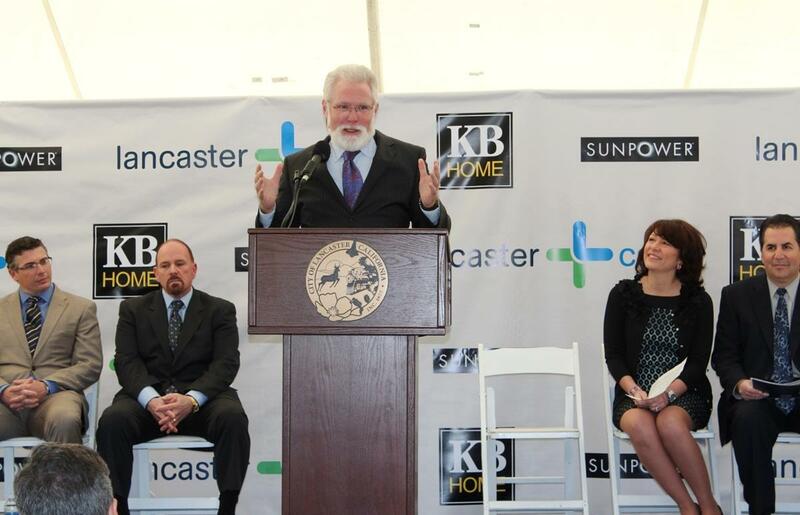 LANCASTER – KB Home and SunPower Corp. came together for a special event in Lancaster Thursday morning. In a little over a year and half, KB Home has built more than 1,000 new homes powered by SunPower’s high efficiency solar power systems. More than 200 of these homes are in Lancaster. During the event, the 1,000th homeowner, Joe Ellison, was surprised with a free upgrade to his standard-size solar power system. During an event Thursday morning, at KB Home’s Dorado Skies community in east Lancaster, KB Home and SunPower surprised new homeowners Joe and Brittaney Ellison with a free upgrade to their standard-size solar power system. Dorado Skies is one of KB Home’s newest communities in Southern California where SunPower solar systems are included as a standard feature of every home built. KB Home estimates that the standard 1.8-kilowatt (kW) system provides up to 40 percent in energy cost savings per year when compared to a typical resale home. The Ellisons’ home was built with a 3.2 kW system, which means they could enjoy up to 80 percent in energy cost savings per year, according to the homebuilder. KB Home has completed four communities with solar-powered homes in the city of Lancaster, and is currently selling solar-powered homes at two other communities in addition to Dorado Skies. KB Home has additional communities in Texas and Colorado, where SunPower systems are offered as an option. In total, KB homeowners of the 1,000 solar homes are expected to save nearly $1 million annually on their electricity costs as a result of their solar power systems. According to estimates providing by the U.S. Environmental Protection Agency, the systems installed at KB Home communities offset the production of more than 3,700 tons of carbon dioxide per year, which is equivalent to removing 703 passenger vehicles from the road annually. To learn more about KB Home and its communities across Southern California, as well as nationwide, visit kbhome.com or call 888-KB-HOMES. 22 comments for "KB Home and SunPower celebrate 1,000th solar home"
There are now more effective ways than ever before. the negative effects underwear may have towards skin one. Dr Doris Day, a dermatologist, says,” Go outside in the daylight with clean skin and bring a mirror. If there were, I’d be doing it. You’ll need to work as hard to detoxify and remove unnecessary chemicals, preservatives and pesticides which” poison” the connective tissue in your skin. The question still remains (even though it was removed), will Rex let the guy keep the dog? It looks like of pit bullish to me….. The “question” is another lame attack at R. Rex that lacks substance and makes the asker appear childish. 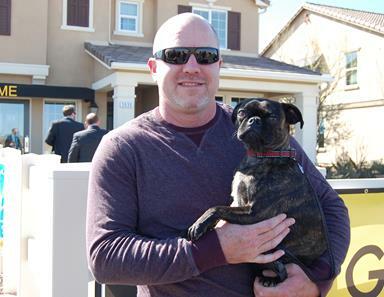 I’m not a Rex cheerleader, but geesh, what does Rex have to do with whether or not a HOMEOWNER can keep a pug at his home? If there is an explanation behind that, perhaps you should share it with your comment. If there isn’t, then these sorts of “questions” only weakens your argument against Rex. If Rex is squandering my hard earned tax dollars or making shady business deals at the citizens’ expense and you have proof of this, then share it with us. But calling the guy names and asking “questions” that are more like thinly disguised attacks does nothing to help your cause! Wow. A little touchy are we? You must be Rex because the sense of humor is distinctly lacking and the pompousness is greatly in evidence. Me? Rex? LOL!! That’s a good one. Too much melanin to be Rex. I don’t believe humor should be derived at the expense of others, and I don’t enjoy seeing other people bullied. I know you guys say Rex is the biggest bully around, but on this forum you guys are the bullies! You attack Rex every chance you get, whether or not he has anything to do with the topic at hand. I would really like to see some substance behind these attacks. I’m a person who doesn’t care about Rex one way or the other, but when I see these mindless attacks, I can’t help but stick up for the guy. For a “mindless attack,” you sure are letting it get in your head…. Wow! You really threw me off the trail there with the “too much melanin” comment. Thanks again, Rex, for being the face of destabilizing the economy of the AV. Our already existing homes aren’t worth Jack, and yet you approve all this new, soon to be Section 8, housing. Incredible. With so many foreclosures, building more homes mean lower prices. Economics 101. What id_iots! True, but this is also why they are not releasing a huge portion of the available inventory of foreclosed homes. Vacant houses are going to stay vacant and off the market so they (aka the banks) don’t enable prices to tank. Housing Bubble 2.0. You can only keep prices artificially high for so long. I see another “crash” coming once interest rates rise in a few years. The prices tanking are only a small part of the equation. The bank also does NOT want to have to adjust their reserves. The bank may also be working behind the scenes with an investor. All the abandoned, vacant houses, with no bank signs or other sign that it may be “handled” is what is bringing our neighborhoods down. So the thought, of “keeping it off the market will drive prices up”, is crazy. Who wants to live on a street that looks like a ghost town? Let’s see: a recent report was given at the LC city council meeting praising the program to help builders finish uncompleted houses, so the neighborhoods won’t look trashy. Now, with all the forcelosed vacant houses in town, we are building more houses that will be vacant. By the way, why is it everytime you see a photo it is always Parris, Johnson, Boznigian,etc? Where is the rest of the city council? Where is the rest of the city council? Probably working for a living.. remember it’s a part time job, and not everyone can get to every press conference.. since they have one almost every week and twice on Wednesdays..
Don’t they get paid for this part time job? All these new houses are ripe for the investors who will then rent out to Section 8. There is a possibility that this latest debt crisis may eliminate some of the funding for the Section 8 program and that’s good for us. Because of it takes 4 to 5 years to pay for the cost of the solar panels from the saving on our electricity bill, solar panels are attractive to family homeowners but not to landlords. The reason for this is the tenant pays the electric bill. -Double”huh “- do you think someone is posing as Rex? Only 20% are from Lancaster, why are the rats in city hall taking credit for 1,000 when they only built 200. Same old spin spin spin. Doc Rivers, they are only taking credit for the 200, not the 1000. It helps to read the whole article.